We’d love your help. Let us know what’s wrong with this preview of Hidden Talents by David Lubar. Martin Anderson and his friends don't like being called losers. But they've been called that for so long even they start to believe it. Until Martin makes an incredible discovery: each of his friends has a special hidden talent. Edgeview Alternative School was supposed to be end of the road. But for Martin and his friends, it just might be a new beginning. To ask other readers questions about Hidden Talents, please sign up. This is actually my second read... when I found out there was a sequel I decided to reread this first and am glad I did. It's a bit earnest, and the hook has been done elsewhere, but I do appreciate Lubar's voice and am not surprised he's popular among his target audience. I think this deserves the awards it's gotten. Recommends it for: anyone that likes ironic books that keep you going till the end, and have surprise endings. 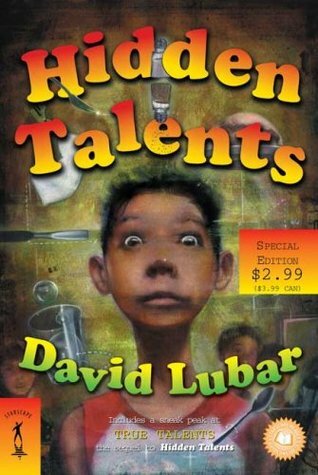 The book Hidden Talents, by David Lubar was a very, very good book. It is about a young boy, about our age, who has gotten kicked out of all of the schools back in his hometown for lipping off to the teachers and somehow always knowing just the right thing to make them feel bad. Now Martin is onto his last resort, Edgeview Alternative School. At this school he pretty much starts to do the same thing. He begins meeting a lot of new friends in the process and eventually finds out that they all ha The book Hidden Talents, by David Lubar was a very, very good book. It is about a young boy, about our age, who has gotten kicked out of all of the schools back in his hometown for lipping off to the teachers and somehow always knowing just the right thing to make them feel bad. Now Martin is onto his last resort, Edgeview Alternative School. At this school he pretty much starts to do the same thing. He begins meeting a lot of new friends in the process and eventually finds out that they all have special psychic powers. For example, his friend Torchie can light things on fire using his mind, but he is always denying that he lights stuff on fire. The rest of Martin's friends also have powers, but they too, deny it. Eventually Martin proves it to them, and helps them practice with their powers to perfect them. But Martin feels bad because he thinks he is the only one without a power, but he was wrong. He too has a power of his own, and at the end of the book, he uses it to help save the school of Edgeview from being closed down by the towns people. What I liked about this book was that it had me hooked right from the start, and I couldn't put it down. Also, I liked that I could relate to this book in many ways. For example, this famous quote is from a character named Bloodbath, "Hey, this is a toll road," Bloodbath said, holding his hand out. "Pay up." I can relate to this is because it reminds me of my daily life at school, and the people around me. At school there is always that one kid that just picks on everyone, and steals their lunch money and such things, as Bloodbath does to Martin here. "They", are called the bully. Or this quote, that reminds me of that one friend who is always lipping off to the teacher and getting detentions, "Make that a weeks detention." "Fine, I dont care!" There were no things to dislike about this book. Maybe only that it could be longer, because I was having such a great time reading it I didn't want it to end. I think i literary term that could easily be linked to this book is Irony. Its very ironic because Martin is finding out that all of his new friends have these cool psychic powers, and he thinks he has nothing, except the ability to get in trouble with teachers. But he was wrong. Near the end of the book, Martin finds out that, he too, has a power of his own! How ironic! Here is a quote that demonstrates this irony, "So, for the moment, there were five of them. I mean, there were six of us, but only five were specail." Wow. You can just tell here that Martin really feels left out that he doesn't have a cool special power too, but it is very ironic, because in the end you find out that Martin does infact have a power of his own! What a surprise ending! This review has been hidden because it contains spoilers. To view it, click here. In this book Martin is sent to the districts special school for kids who have behavioral problems. When Martin first gets there he makes friends with his roommate, Torchie, a kid who is constantly accused of setting fires. Torchie introduces him to Lucky (always accused of stealing), Cheater(always accused of cheating), and Flinch(talks out of turn in class). Eventually Martin realizes that his friends have special powers; Torchie can set fires with his mind, Lucky hears the items talk to him, F In this book Martin is sent to the districts special school for kids who have behavioral problems. When Martin first gets there he makes friends with his roommate, Torchie, a kid who is constantly accused of setting fires. Torchie introduces him to Lucky (always accused of stealing), Cheater(always accused of cheating), and Flinch(talks out of turn in class). Eventually Martin realizes that his friends have special powers; Torchie can set fires with his mind, Lucky hears the items talk to him, Flinch can see into the future, and Cheater hears other people's thoughts. When Martin first tells his friends about their special powers, they are in denial and get angry with him. For the next few days, Martin sits with Trash at lunch, a boy who is always accused of throwing things around (it turns out he is a telekinetic, he moves things with his mind. Martin helps his friends get control of their powers all the while feeling left out. He introduces his friends to Trash when they sort out their disagreements. Then the committee decides they want to speak to a student and Martin is selected. The principal is very worried because Martin has a tendency to say extremely rude things to people. Martin's friends explain to him that this is his power. He can see into people's hearts, their worst fears and their greatest dreams. They tell him to try and use his powers to say nice things to the committee. Martin decides to tell the committee the truth. He explains how helpful the school really is, but that there are some students that are much more violent and cruel then the rest of them that make it hard for the kids who want to change. He also explains that the students should get the opportunity to be evaluated more then once, because it isn't fair to only give people one chance. The committee makes the changes Martin suggests. After two months Martin goes home. He has realized that his father is a bully and that his sister needs him. Eventually all of his friends go home as well. Gah. Just lost the review I wrote for this. ANYWAYS, my only complaints about this book was that it was too short (but it's written for a younger audience) and for the length of the book, it took too long to get to the actual meat of the thing. But, I still enjoyed everything along the way. This book is ridiculously easy to relate to, even if I'm not a pre-teen boy who has hidden talents. This book struck more of a chord with me than most of the adult books I read, emotionally and otherwise. Simpl Gah. Just lost the review I wrote for this. This book is ridiculously easy to relate to, even if I'm not a pre-teen boy who has hidden talents. This book struck more of a chord with me than most of the adult books I read, emotionally and otherwise. Simple books just translate universally so well. This book is very relatable for everyone who has ever felt like they did not fit in somewhere. It is light and easy to read, and Lubar's trademark sarcasm and sense of humor is in every character. The storyline didn't really peak my interest but it was still a fun read nonetheless. Definitely pick up any of Lubar's books if you need a light read. I read this about . . . 7 years ago, maybe? I don’t remember exactly when. I read the second book first, then read this one. I remember not being that impressed. True talents lie in acceptance of personal imperfections. "Hey, if I could read minds, I'd be thinking about how I could use my power to rule the world," I said. "You sounds like a cartoon character," Lucky told me. Flinch nodded. "Martin Mindmaster, Conqueror of the Universe." Lucky started laughing, "With his faithful sidekick, Zucchini, who can read the minds of vegetables and fruits." Leafing through my worn out pages of a book I read so many times before, I feel the True talents lie in acceptance of personal imperfections. Leafing through my worn out pages of a book I read so many times before, I feel the same joy I felt the first time reading it many years before. Giggles escape my throat since I am astound by brilliant quotes like the one above. The thought of a superpower in reading the minds of healthy food resonates with me every time. Hidden Talents is a special novel to me. Lubar makes a simple story extraordinary with his incomparable wit and outstanding narrative. Every time I settle down to read this story, I am immediately hooked. Martin reputation, one of arrogance and rudeness, is farther from the truth. Too bad the world does not realize this fact. Teachers, parents, all the people in charge just do not like him. His big mouth leads to his downfall of being expelled by too many schools. The novel starts with Martin on the bus to the special high school for juvenile delinquents, the ever-exciting Edgeview. Edgeview holds Martin's journey to maturity, true friends and the discovery of supernatural talents. I absolutely love how between each chapter there was little letters, poems, or scripts of scenes that revealed the thoughts or events of the lives of the other characters besides Martin. Above all, I love the "Why I like being me?" pieces that each of Martin's friends wrote. Especially the one of my favorite character Trash. He is certainly not a worthless piece of rubbish to me. He is a star in my mind. "I'm sorry this is late, but I didn't feel like doing it before. Anyhow, I guess I like being me because I'm a good artist. I really like to draw. It feels good to create something new. It feels bad to destroy things. When I pick up my pen and start drawing on a blank piece of paper, I know I can make something wonderful." What really makes Hidden Talent remarkable is its characters interwoven with its simple story of boys with superpowers rebelling against conforming and learning to fight for what is right. Forgetting the restraints society set and forgiving society's misjudgments. Each character has an important role to play. Martin, the brilliant protagonist is the one who unites his friends to their full potential while learning more about himself too. Martin and his friends, Torchie, Lucky, Finch, Cheater and Trash, are all grow up magnificently throughout this novel as they learn the truth about Edgeview, their first place to belong. They are real heros! I enjoyed the genuine journey as the group of friends steadily learn to accept what they wish was not true. Every scene is full of spark; from forgiveness scenes to playing in an arcade to a delightful science experiment that I wish I could do in school. I love the action-packed finale with its surprising revelation. "I imagine every talent has a price, both the talents we know about and the hidden talents - the gifts we haven't yet discovered." This novel in essence is one of talent. I read the book Hidden Talents by David Lubar. I liked this book because it has to do with telekinesis, and it is about kids our age. What I disliked about the book was that it was too short and everything happened too quick. I learned from reading this books that Martin Anderson, a boy with a big mouth, is sent from his school to an alternative school called "Edgeview Alternative School". Edgeview is where pretty much the whole setting was. Martin has been expelled from a lot of other schools f I read the book Hidden Talents by David Lubar. I liked this book because it has to do with telekinesis, and it is about kids our age. What I disliked about the book was that it was too short and everything happened too quick. I learned from reading this books that Martin Anderson, a boy with a big mouth, is sent from his school to an alternative school called "Edgeview Alternative School". Edgeview is where pretty much the whole setting was. Martin has been expelled from a lot of other schools for going out of his way to make a teacher fell bad and then he gets in trouble. When Martin goes to Edgeview he really gets mouthy with all his teachers except Mr. Briggs. He is roomates with Torchie and he meets a lot of friends including Torchie (who starts fires, but says he doesn't), Lucky (a kid who is always lucky at finding hidden objects, but gets really upset if you call him a stealer), Cheater (a really smart kid who always gets 100%s and is always convicted of cheating), Flinch (a hyper kid who is always jumpy and bouncy), and Trash (who just throws stuff at people). As he starts to hang out with his friends more, he goes into the town of Edgeview and sneeks out to an arcade. Later, Martin finds out that they all have hidden psychic powers, but none of them will admitt it. He helps them to practice and control their powers, and use them wisely so no one will find out their secret. Later, Martin feels sad that they have powers and he doesn't. He feels left out. Shortly after, they find out the school might close and they are having an inspection. Bloodbath, a bully, is trying to screw the inspection up, but Martin and his friends use their powers to stop him. At the end of the inspection, Martin is called in and he has to help save the school from the citizens of Edgeview who want to close it down. He discovers he to has a psychic power at the end of the book. Martin has just been sent to the Edgeview Alternative School for kids who have gotten expelled from everywhere else. Martin's major problem is that he just can't stop himself from saying really insulting and hurtful things to people. He seems to fit right in with most of the other kids at the school - his roommate Torchie, who burns things but says he didn't; and Cheater, Flinch, Lucky, and Trash. The school bully Bloodbath just sees Martin as a new punching bag. As the weeks go by, Martin start Martin has just been sent to the Edgeview Alternative School for kids who have gotten expelled from everywhere else. Martin's major problem is that he just can't stop himself from saying really insulting and hurtful things to people. He seems to fit right in with most of the other kids at the school - his roommate Torchie, who burns things but says he didn't; and Cheater, Flinch, Lucky, and Trash. The school bully Bloodbath just sees Martin as a new punching bag. As the weeks go by, Martin starts to notice that his new friends have some interesting talents. Martin decides he needs to prove to them that they have supernatural powers if he wants to keep Edgeview from getting shut down by the town. Despite Martin's issues, he's a likable character. The story was told in a light tone, and it was clean enough for a middle school audience. I liked the pieces of writing assignments, letters, and internal memos between each chapter - they added a little more to the story (mostly the subplot of the town wanting to shut down Edgeview). Martin's relationship with his father was interesting as well, and I would have liked to see that explored more. As a book club activity I'm planning on doing some experiments with Zenner cards like they did in the book. The main character [Martin] is frequently getting into trouble for his smart mouth. He just seems to have a natural gift for saying the exact wrong thing at the wrong time, leading him to be on every adult's bad side. Finally, the decision is made to send him away to a reform school, hoping he'll learn something from the experience. There, he makes friends with an odd cast of characters, including a pyromaniac known causing fires even in the controlled school setting. But the longer he's there, the more oddities seem to crop up, leading him to wonder - how many of his friends claims of innocence - their claims that they hadn't intentionally caused the harm they've been blamed for - are actually true? And what's going to happen when the boys begin to figure out how these odd occurrences can be controlled? This is a story about Martin Anderson who goes to edgeview alternative school.Martin had to go to a special school because he was a very bad kid.One thing that I liked about the main character was that he had a special talent.His talent is really cool.Something that bothered me was that there were a lot of bad kids that do bad stuff.People who like to read mystery will like this book because,all of Martins friends have talents. When no other school will take you … you end up at Edgeview Alternative. Martin Anderson is one of those boys. All the kids there have been treated like freaks and rejects for so long that they have all started to believe it. But when Martin gets to the school he notices something that no one else seems to see. Some of his new classmates have special abilities. Martin helps them figure out their hidden talents, but how they use them he never could have expected. The kids in this book have really When no other school will take you … you end up at Edgeview Alternative. Martin Anderson is one of those boys. All the kids there have been treated like freaks and rejects for so long that they have all started to believe it. But when Martin gets to the school he notices something that no one else seems to see. Some of his new classmates have special abilities. Martin helps them figure out their hidden talents, but how they use them he never could have expected. The kids in this book have really hard lives. I was really impressed with that author and how he basically revealed their powers. I felt sorry for the kid who moved things with his mind. I could see how if you got angry a lot and things seemed to fly around and break all the time around you so you get blamed for all the damage even if you didn't touch things … that would get annoying and just make you even more angry. Poor kid! Anyway, If you want a good book for boys and don't mind the idea of hidden powers then this would be a good one for you. I love this book. I picked it off the shelf last night and read a few pages to my kids. They didn't pay any attention, but then I went and finished it today. I remember when I randomly picked it up from the library years ago and loved it so much I read twice in a row. It's still one of my very favorite books. I am over 50 and I still enjoyed this book. It is like a Hunger Games for the younger set. It looks like there is a second book in the series which I have to go to the library to check out. About a bunch of delinquents who are sent to a boarding school for troubled kids. One of the boys figures out that his friends have hidden talents and has to convince them first that they have the talent and then how to use the talent for good. This is proof positive that the publishing companies that give books to classroom teachers at NCTE are not wasting their money. I had never heard of this book before I received this copy and I read A LOT!! It’s a great book for any middle school classroom. High interest concept, fast moving chapters, intriguing characters, with a hint of super powers. I raced through this and can’t wait to share it with my students! This review has been hidden because it contains spoilers. To view it, click here. Wow. That was such an amazing read! I recently watched a mini movie and the main character had telekinesis, so the charter Trash had to be my favorite. When you first meet Martian, you know so little, but throughout the book you learn who he is and so much about the characters you only can wish that there was a sequel. My favorite thing is to watch the six friends realize that they can do stuff with there minds. I wish that I had a science teacher like Mr.Briggs. A young boy is sent off to a different school for troublemakers. There he meets a group of boys who unknowingly have psychic powers. Strange things start happening around them and they slowly discover the power they hold within. When the government finds out they attempt to capture and control the young boys' power. Which wasn't as easy as they thought. This is a Young Adult (YA) novel I'd give to any kid or any adult who was a kid like I was - loner, lonely, outcast, etc. If you weren't popular or one of the bullies, you'll probably enjoy how these kids figure things out and manage to carve out improvements despite the many obstacles facing them. 8th grade summer reading choice. Not bad. This book is ideal for young adults. It is awesome! Cute story about a group of boys at an alternative school (the end of the line) who find out there's more to them than meets the eye. This book is really fun to read. I really recommend it! I rated this book 4.99999999999999999999999999999999999 stars not 5 stars. This book was very strange because each main character had a super un-natural talent like someone who can fly (none of them can). Martin can hurt people with words, Flinch can sense what his opponent is going o do next, Trash can make stuff float, Lucky can find anything and Cheater can read minds. David Lubar created a sensation with his debut novel, Hidden Talents, an ALA Best Book for Young Adults. Thousands of kids and educators across the country have voted Hidden Talents onto over twenty state lists. David is also the author of True Talents, the sequel to Hidden Talents; Flip, an ALA Best Book for Young Adults and a VOYA Best Science Fiction, Fantasy and Horror selection; several short David Lubar created a sensation with his debut novel, Hidden Talents, an ALA Best Book for Young Adults. Thousands of kids and educators across the country have voted Hidden Talents onto over twenty state lists. David is also the author of True Talents, the sequel to Hidden Talents; Flip, an ALA Best Book for Young Adults and a VOYA Best Science Fiction, Fantasy and Horror selection; several short story collections: In the Land of the Lawn Weenies, Invasion of the Road Weenies, The Curse of the Campfire Weenies, The Battle of the Red Hot Pepper Weenies, and Attack of the Vampire Weenies; and the Nathan Abercrombie, Accidental Zombie series. Lubar grew up in Morristown, New Jersey, and he has also lived in New Brunswick, Edison and Piscataway, NJ, and Sacramento, CA. Besides writing, he has also worked as a video game programmer and designer. He now lives in Nazareth, Pennsylvania.